This is the kind of thing I could happily eat every day. During the cooler months I constantly crave braised greens. I often braise them with beans or chickpeas and serve with a poached egg for dinner. They are great smeared on a pizza or just on top of some grilled bread for a quite tasty and satisfying lunch. I was fortunate to have some homemade ricotta on hand, but fresh mozzarella would be just as fine. I will often forgo the cheese and top with a poached egg. This dish has quite a lot going on for being so simple. The braised escarole is slightly bitter (like most chicories), there is brininess from the olives and capers, a tingle on the back of the tongue from the vinegar, spice from the chili flakes, and it sits on a fluffy base of sweet, creamy ricotta. It really doesn't get much better. Heat a saute pan over medium flame. Add the olive oil, garlic and chili flakes. Cook for about a minute until the garlic just starts to color. Add the olives and capers and cook for a few seconds. Add the escarole and turn the heat up to high. The escarole will give off quite a bit of water as it wilts. Let it braise, stirring occasionally, until most of the water has evaporated. This should take about 10 minutes. Taste and correct for salt. The olives and capers add a bit of salt so I usually wait until the moisture has reduced before I add extra salt. Add some red wine vinegar to taste. I probably added a tablespoon. Just add a teaspoon at a time and taste after each addition. You may need to adjust for salt again because adding vinegar counters the taste of salt. Set aside. Lightly coat the bread slices with some olive oil. Place in the toaster or grill. Rub the grilled bread with a clove of garlic. This adds some bite, as in spicy garlicky heat, to the bread and makes it irresistible. Top the bread with a smear of ricotta. Sprinkle the ricotta with some fleur de sel (kosher salt would also be fine). 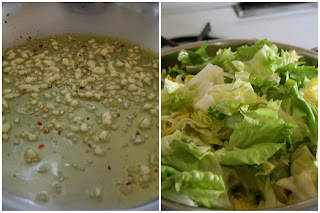 Top with the escarole mixture. makes about 4 slices of bruscetta. Thanks for the feedback! It's great to hear that people are actually using the recipes I post:) This combo is also great if you replace the escarole with broccoli rabe. Another one of my favorite vegetables.... I love me some dark greens!! !